Patriot Mills continues its tradition of donating carpet to Habitat for Humanity. These generous donations enable Habitat to fulfill a mission of providing safe, decent, affordable housing to families in need. Often these families are coming from unsafe and unsanitary conditions. Habitat has documented the improved health of children and families once they receive their new or renovated home. 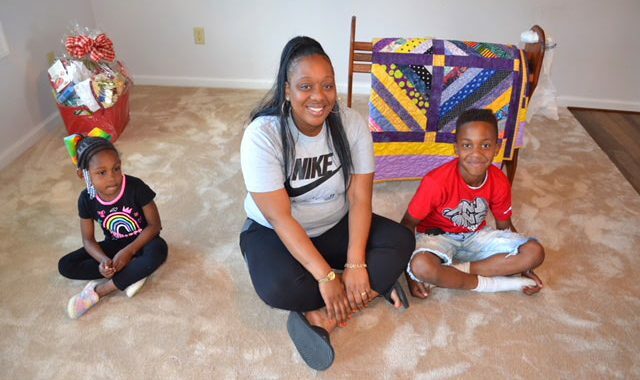 “Recently, Patriot Mills donated carpet for a home rehabilitation in Trion, GA. A home dedication was held on March 30 celebrating the completion of the home. Destiny Evans and her son began moving in the next day. The donated carpet and other improvements gave the house a like-new appearance. Destiny is thrilled with every inch of her new home, especially the beautiful new carpet.